★Please don't stretch the elastic web too fiercely.It may get deformed after long time use,but it's not the quality problem and never worry about it !!! It will recover by easily kneading with fingers. ★We don't suggest wash it and we do suggest buy two belts in turn if you'll use it frequently. 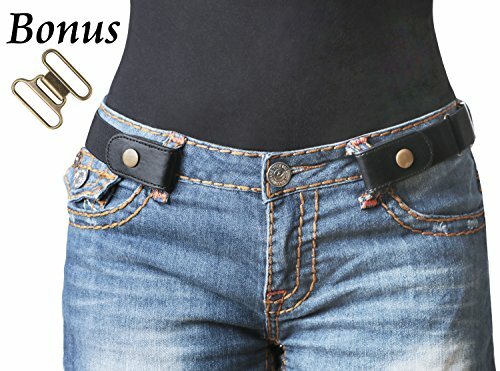 ☘ Bonus Interlocking Buckle- Practical interlocking clasp makes it two ways to wear.Not only a perfect belt for pants and jeans,but also a fashion accessory for dresses,down jacket,wind coat and sweaters.And it will reduce the stress on pants loop if you use it as pants belt with this buckle.